Join us in sharing hope across America! 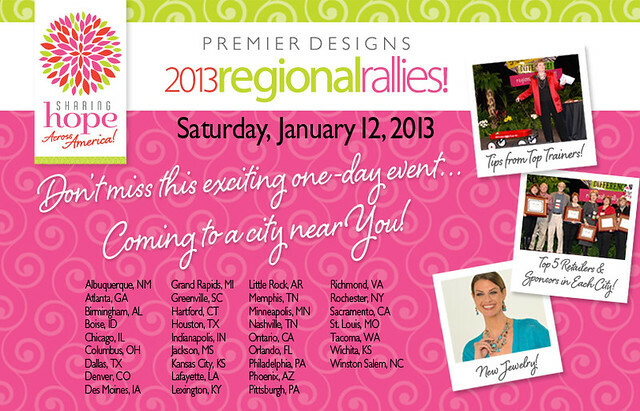 Save the date and plan to be with us at one of Regional Rally locations on Saturday, January 12th, 2013. Don’t miss this exciting one day event that is coming soon to a city near you! We are a direct sales jewelry company founded in 1985 by Joan and Andy Horner in Dallas, Texas. Independent Distributors, called Jewelers, market Premier Designs jewelry in homes all across the U.S. and Puerto Rico. For more than 26 years Premier Designs has stayed true to our founding Philosophy, Purpose and Objectives. -Opportunity for mothers to be able to stay home more with their children. -Provide encouragement and extra income for single moms. -Provide a way for individuals, especially those in full-time Christian work, to meet their financial needs. -Be a company that would support ministries around the world and in America.